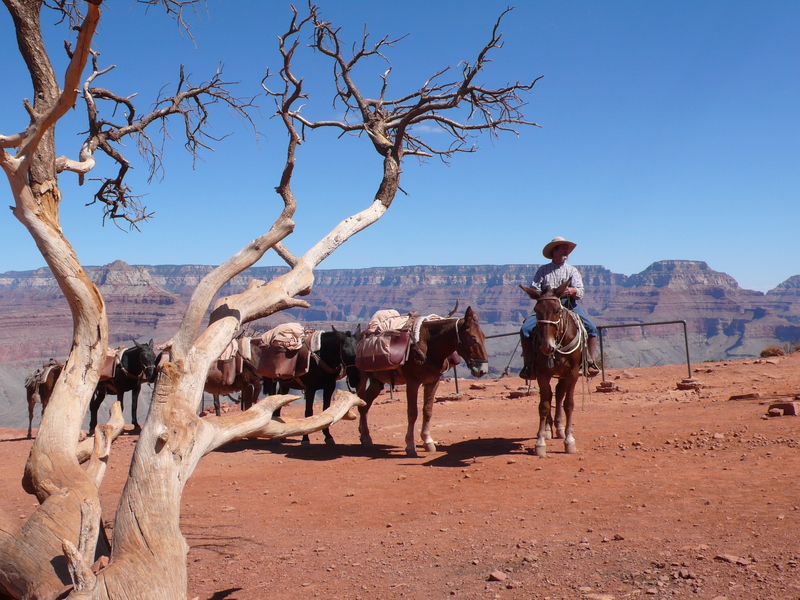 EL TOVAR LODGE, GRAND CANYON VILLAGE, AZ – The icy, tart-sweet juice of the Prickly Pear Cactus Margarita washed down our parched throats and the tequila coursed through our muscles, aching from the day’s hike to Skeleton Point on the South Kaibab Trail. 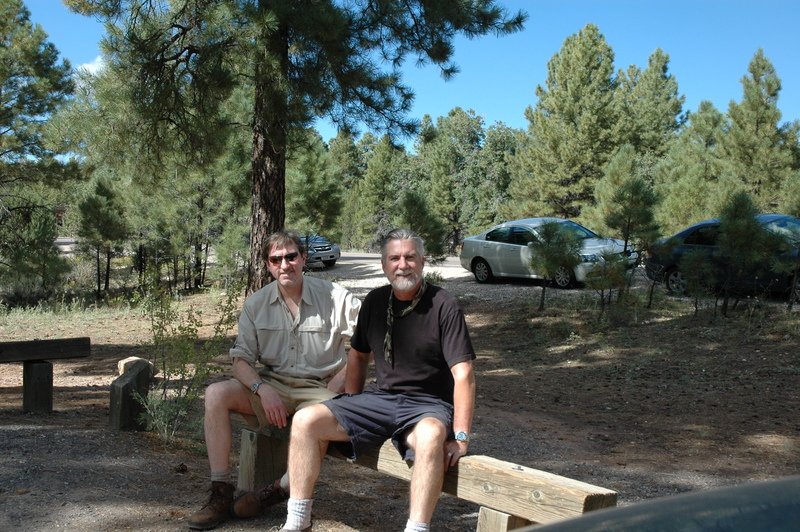 A warm glow set in as we stared out at the vista from the huge back porch of the El Tovar, knowing that these two founders of the INHL, James Davison and Dave Etzold, actually now “knew” the Grand Canyon in an intimate way. 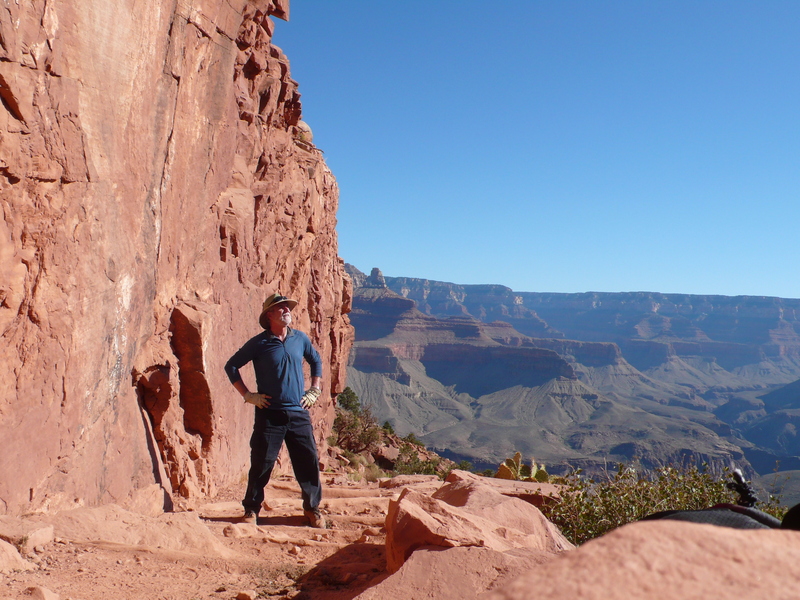 Dropping into that Canyon, diving off the rim on the narrow, steep South Kaibab Trail had been an incredible first experience! It had been an early start that morning, up before dawn at the Red Feather Lodge in Tusayan, a quick breakfast and drive to the South Kaibab Trailhead at Yaki Point Road off of Desert View Drive just as the first light of the sun hit the tops of the pine trees. The morning air felt cool in late September, almost chilly. 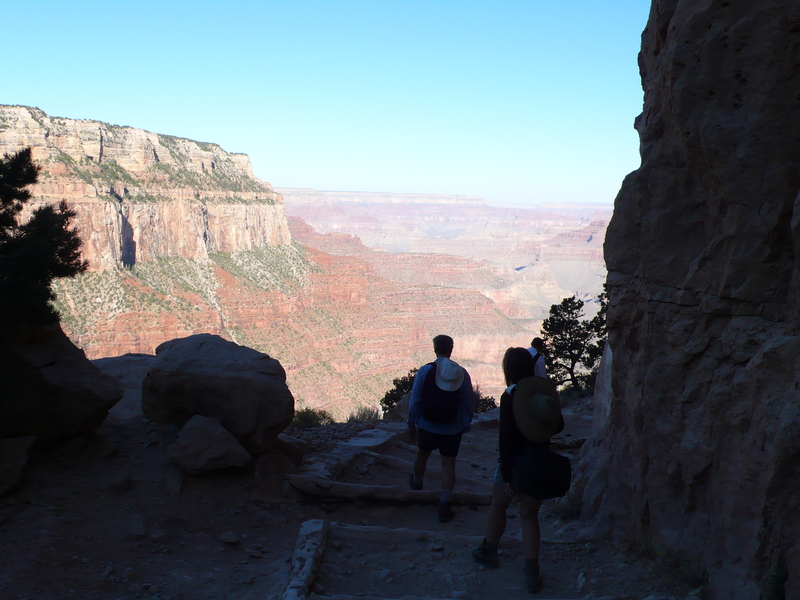 It was bracing as we struck out on the first steps down the trail…into the Canyon and back through time. 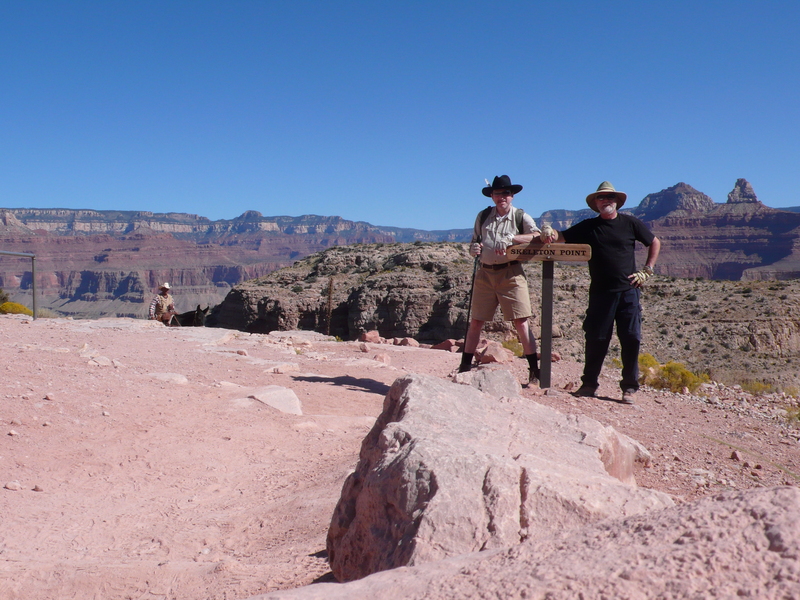 As we dropped below the rim, the shade kept us cool for a while as we traced our way along the trail built in the 1920’s by Park Rangers blasting a new shorter route to Phantom Ranch next to the Colorado River far below. 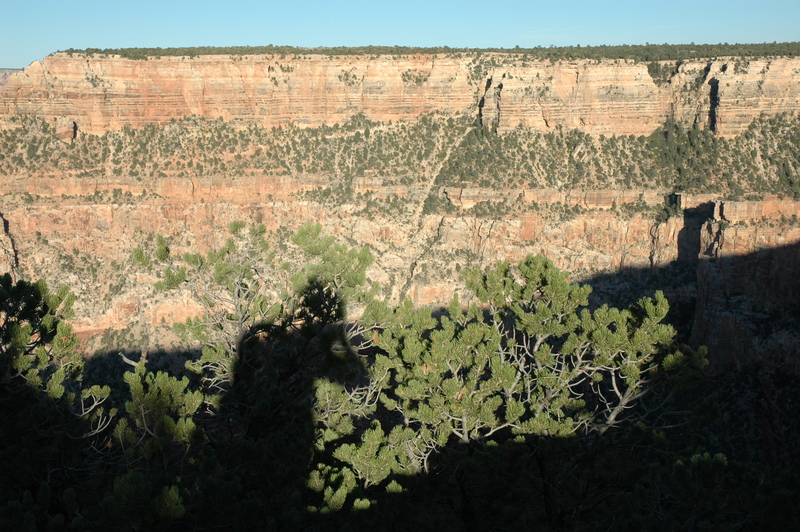 The gigantic proportions of the Canyon were hard to grasp at first, the scale was so immense. Finding similar sedimentary rock formations next to us on the trail, and following those formations around to the far wall of the valley helped keep our perspective. We were now tracing our way down the trail carved through the canyon walls. Observing the similar sedimentary layers wrapping us in the Earth’s grasp made the size of this geologic monster more manageable. We virtually walked through time as we descended that trail: steadily dropping through layers laid down millions of years ago during alternating wet and dry climate era. Cross-bedded sandstone looking like frozen sand dunes blown by ancient aeolian winds; dark fossil-rich patterns of ancient marine sediments from the time this land was immersed under a great ocean; mudstone formed by primordial ooze at the bottom of that ocean; limestone formed from the calcium carbonate in those marine environments; and, igneous and metamorphic intrusions tracking the violent deep-forces in the Earth that penetrated here and sometimes stopped the flow of the mighty Colorado River with their lava. 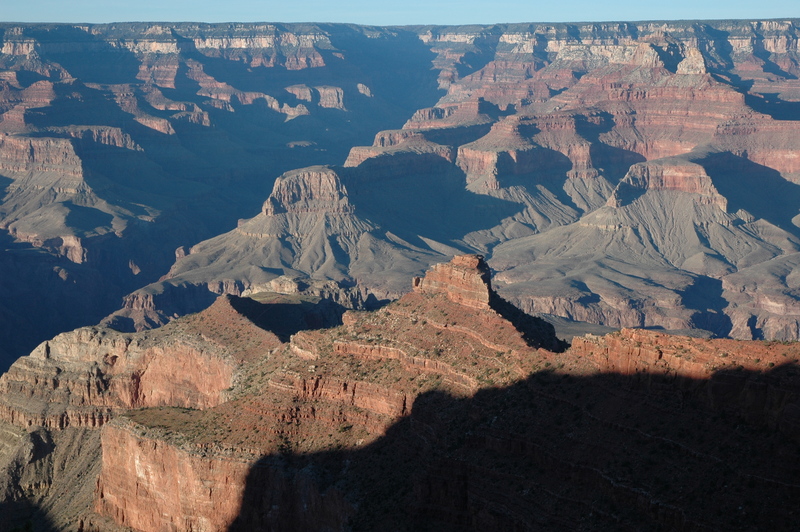 There is a phrase that helps one remember by the first letter of the word, the nine major sequences of rock layers, from the top of the rim to the bottom river channel: “Know The Canyon’s History, See Rocks Made By Time” (KTCHSRMBT). We will explore that key to this grand puzzle later. An unbelievably beautiful landscape spreads out in front of us, and engulfs us on all sides, as we wind our way down the trail, further and further into the world’s greatest Canyon. For now, onwards into the depths, next stop “Cedar Ridge”! Here, on the red sandstone bluff called Cedar Ridge, we rest and watch a mule train climb out of the canyon from the camp on the Colorado River that they must have left hours ago. This was the reason the Rangers had built this trail: to more efficiently serve the needs of Phantom Ranch, the popular shady camp at the bottom of this immense gash in the Earth’s surface. 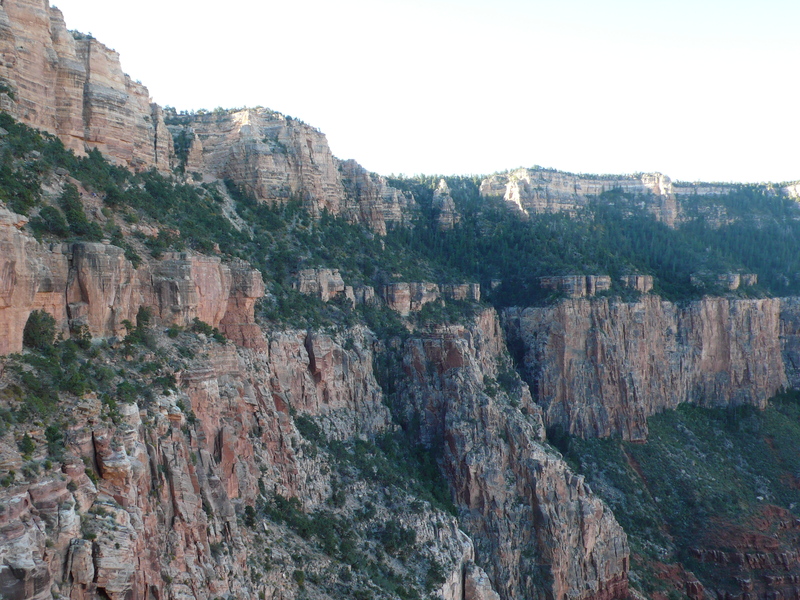 The original trail to the bottom, the Bright Angel Trail, was 30% longer each way. 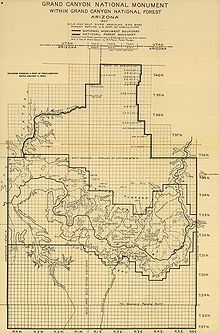 That route was the Native American Indian trail into and out of the canyon bottom discovered by the first explorers to map the area. To get mail, supplies and people down to Phantom Ranch more efficiently, this South Kaibab Trail route was carved through the rocks. Those rocks, now soaking up the rays of the mid-day sun, radiated heat like a furnace on our skin as we worked our way down further, to our turn-around at Skeleton Point. The red rocks of the layer from which Cedar Ridge and O’Neill Butte are made disappear behind us as we continue our descent to the overlook and turn-around point below. Now and then, we hear the echo of approaching mule trains, their hoofs clacking along on the rocks of the trail and the dust from their passing hanging in the still air like mist. One must be very careful not to move too quickly around the mules, and the Rangers advise moving off the trail uphill from the passing animals and their loads. Several times a year these mule trains have been startled and accidents have led to the deaths of some animals and serious injuries to hikers and riders. 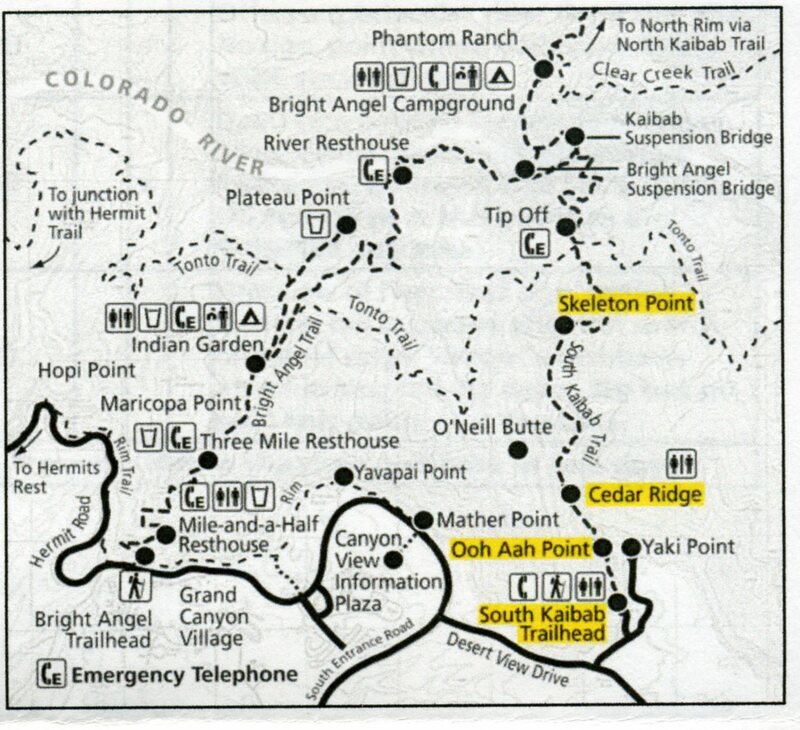 Soon, we see a clearing ahead and a sign post announcing our destination: Skeleton Point, you are now ours! 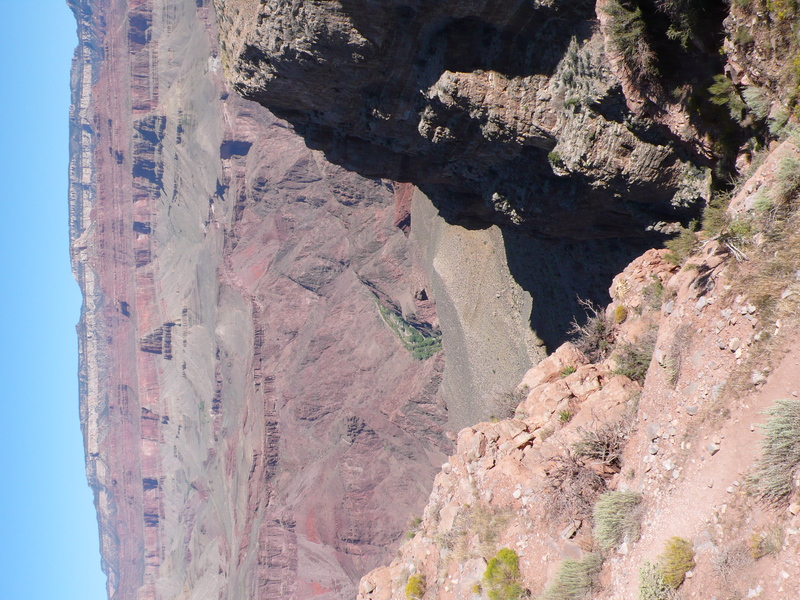 The rest stop and view from Skeleton Point of the Tonto Plateau, and the Colorado River below, was extraordinary. The return was brutal. It takes twice as long to climb out of the canyon as it takes to walk in. 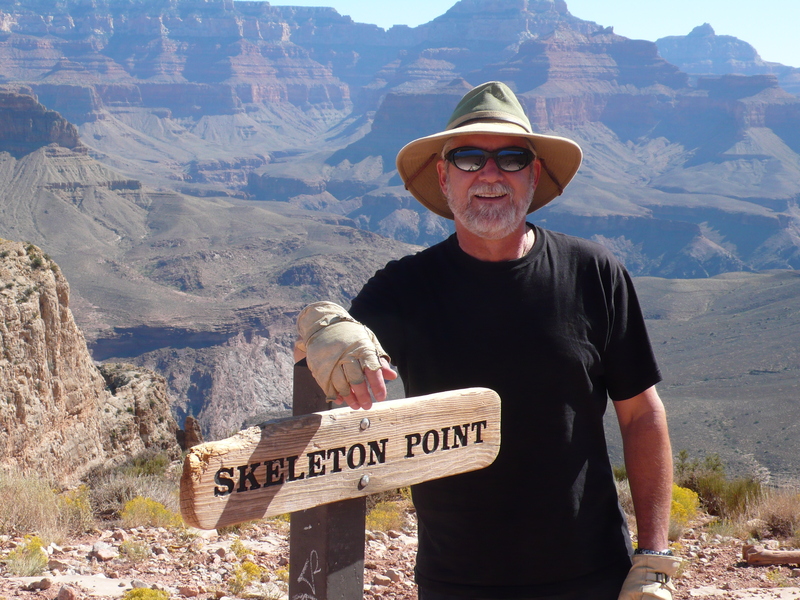 Further, we were now in the heat of the day and, though we were visiting in late September, the temperatures 2,000 feet below the rim and exposed to the full sun of the desert Southwest took its toll on us. When its steep: One, two three, rest; one, two, three, four, rest. When its level, a quicker pace is possible. Never push yourself, and be sure to stay hydrated and snack in small increments frequently to keep your energy up. The trail finally tops off, at the same point we breached in our start six or seven hours earlier. Feet that were so heavy, legs almost like stumps, now found renewed strength in the excitement of the achievement. We had done it! There and back again…. ~ by Dave Etzold on July 24, 2010.